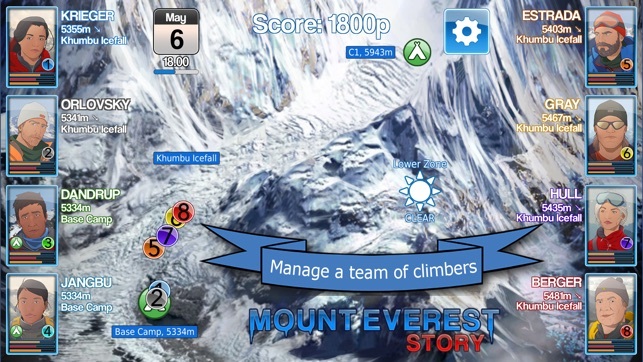 This amazing Everest mountain climbing simulation game dares you! 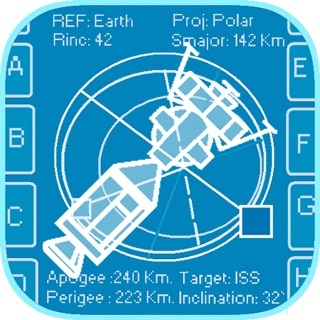 Battle the cold, the thin atmosphere, the wind and the snow! 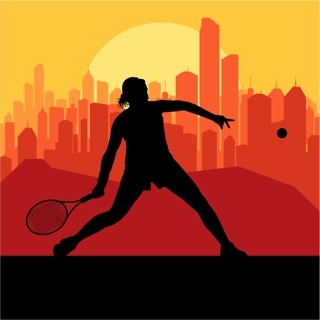 Do your best to avoid debilitating medical conditions! 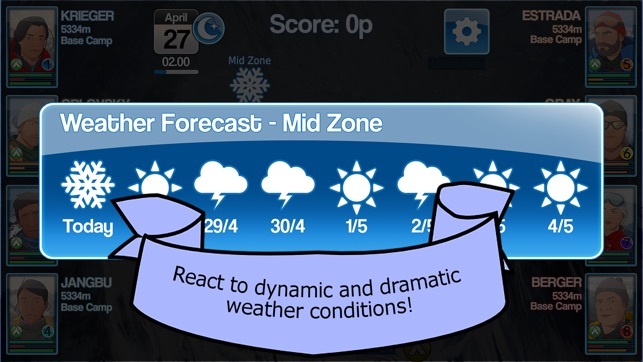 React to dramatic and dynamic weather conditions! Stay alive in the death zone! 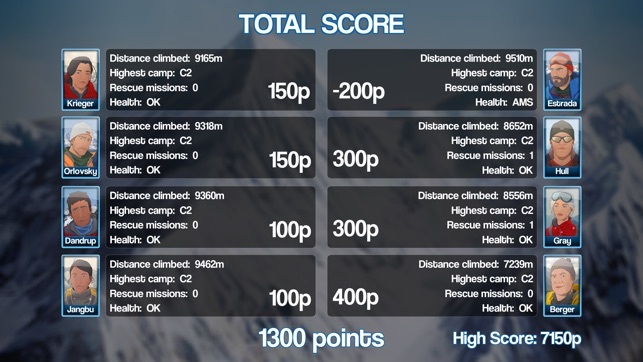 The higher you climb Mount Everest, the more points you will score! But keep your team rested and in good health. There are severe penalties for injuries. -	Simulated concepts include weather, preparation, acclimatization, morale, health, rescuing and much more. Get your team, your supplies and your nerve together as you plan your team´s expedition to the top of the highest mountain in the world! Can you handle the job of being the expedition leader? 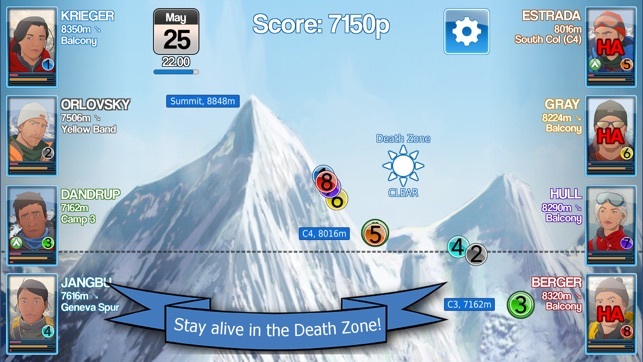 If you are interested in mountaineering or alpinism - this is the game for you. 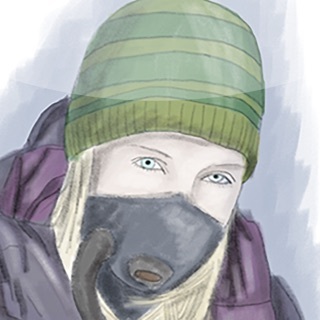 The game is inspired by the bestselling novel "Into Thin Air". By Jon Krakauer. The game is fun. Fairly challenging trying to get your climbers acclimatized and still making it all the way to the top and back while planing around the weather. 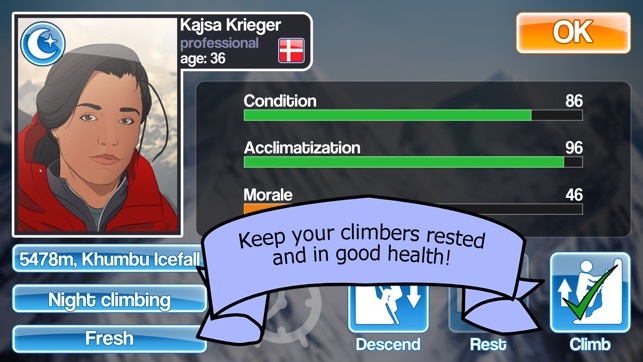 Maybe the developers could add a celebration screen or something when you do get all your climbers home safe after a successful summit. At the moment all you do is wait for the time to run out, see your score, then start again. Bit of a let down to be honest especially from a game you have to buy to play. Other then that it is a pretty decent game. Although I’m not an actual mountain climber, I’m very into Mount Everest. I watch every documentary and read every book I can on the subject. I’m fascinated by the mountain and its climbers. 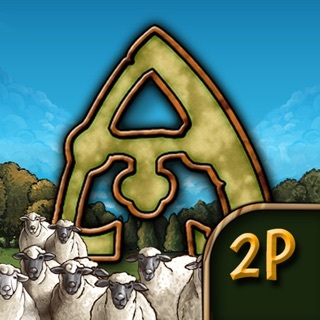 This game is very cool, and features some of the famous landmarks. Yes it could be better- how about avalanches- or falls- or the other side of the mountain as an optional route. But as it is I love this game and play it often still after several months. 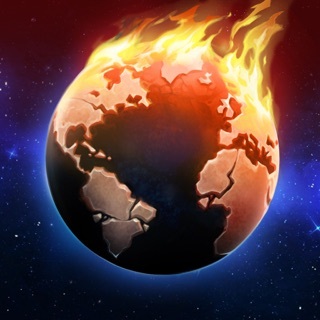 Love this game. Would be awesome if you could choose between alternate routes or if your characters change with each stay.